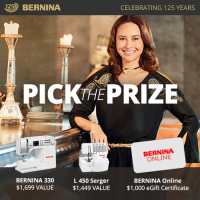 Enter for a chance to win prizes from BERNINA Canada! Valid from August 1 - August 31 2018 to all Canadian residents excluding Quebec who are 18 years or older. Enter to win to vote for the grand prize either a BERNINA B330 a BERNINA L450 or $1000 e-Gift card. There’s also bi-weekly prizes of a golden “foot” and Mettler metallic thread. Visit https://www.bernina125.ca to join this month’s draw. Good luck!